They give your closet a summer makeover, instantly transforming your tops…. in to summer outfits! It’s not a fashion trend, but a wardrobe essential! Some say that white is difficult to wear with kids because it shows stains, but so does black skirts when it’s covered in toothpaste, food or fluff! 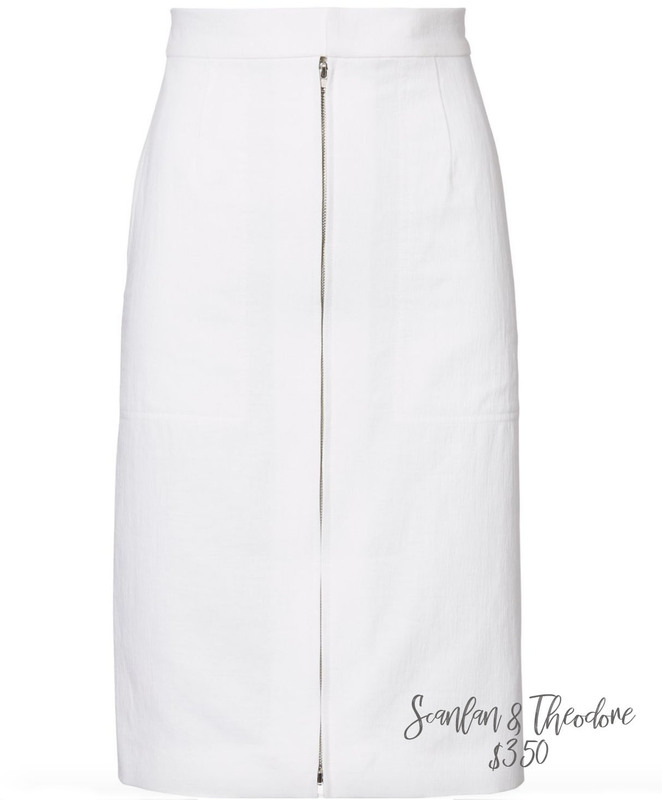 My tip for keeping your whites, white, is bicarb of soda, it’s a wardrobe wizard as listed in my blog I wrote ‘8 Fashion Must Have’s’ which you can read by clicking on the link. 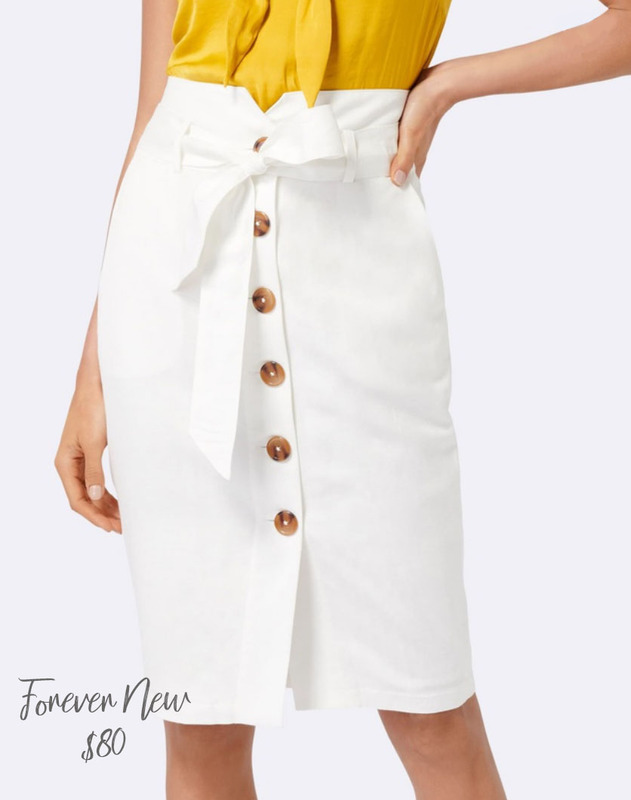 So, simply swap your darker bottom-of-body for one of these white or cream versions and you’ve got summer dressing all wrapped up! 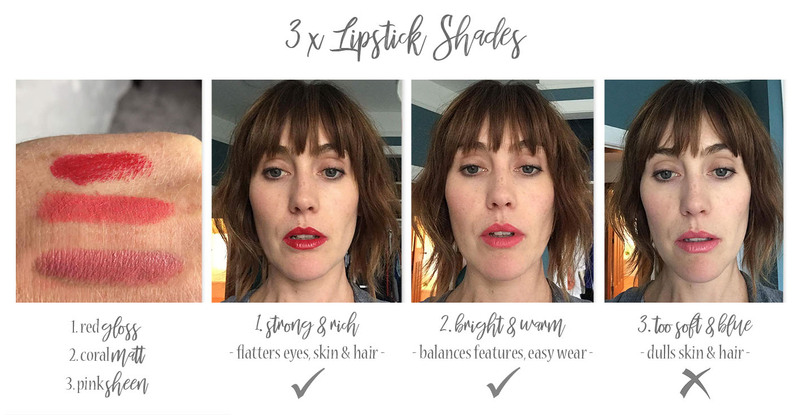 With spring racing, Christmas party’s and new year all within a hop-skip-and-a-jump from each other here in Australia, finding the most flattering lipstick shade is an important part of your fashion style. 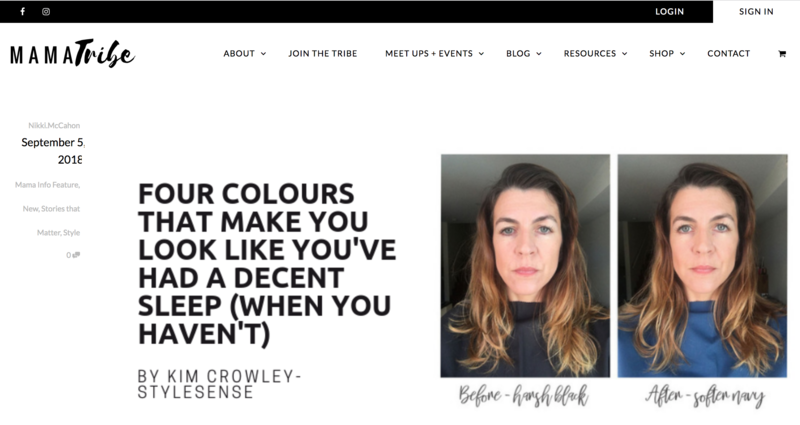 As a PERSONAL COLOUR CONSULTANT, I identify the most flattering colours to suit your individual features but this doesn’t start and stop with clothes, it extends to beauty and make-up too. YOUR PERSONALISED COLOURS ARE THE ONLY SHADES YOU’LL EVER NEED! The whole point of wearing lipstick is to enhance your features, so by wearing the incorrect shade, it actually can have a detrimental effect! My client is an AUTUMN so she has some natural warmth. You can see that 1 & 2 flatter this client in different ways as they too have warmth to them, but colour 3 is too cool blue for her and dulls her complexion…and hair!! If you saw shade 3 in isolation, you’d probably think it was ok but once you try a few shades on and compare, you can clearly see the difference. I suggest that when (and if) you have a few spare minutes, pop in to a make-up brand and ask them to try a few lipsticks on you including different finishes – but take photos in the same light so you can compare one against another as this is when the winner is obvious! You could even book in for a make-up makeover which may cost, but you’ll receive style tips and will be introduced to new beauty products as they’re improving all the time which in turn, improves the way we look for less effort. And we all know that’s a good thing. We’re all guilty of wearing something once and then feeling like you want to move on to the next thing – which is often in the shape of a brand new outfit. However, as a stylist, I look at at potential purchases questioning how many ways I can wear it. Could I wear it to work? Could I make it work casually? It’s ok that not all your belongings can be styled up and down, but we want MOST of them to be to versatile enough to cross your different lifestyle areas, even a show stopper of a dress! Read more about the advantages of WARDROBE PLANNING here. Clothes we buy for ‘best’ enters at the top of the hierarchy and once we’ve worn them for a few events, start then wearing to work …and then for the day! So before you make another purchase, question how to dress it ‘up’ & ‘down’. Does it offer versatility? This forces you to be more accountable for how you spend your money and by giving your clothes a makeover, it breaths new life in to them and keeps them out of landfill, one outfit at a time. If you’d like some more styling inspiration, take a look at my portfolio, particularly the different ways I have styled ‘1 dress 12 ways’ and see if you can use some of the theory on a dress you own? Now, as it’s a new season (cue happy dance) we need to talk about getting your wardrobe essentials in order. One of the main reasons clients find dressing challenging is when they haven’t got their versatile ‘must have’s’ in their closet that effortlessly build outfits time after time, season after season. They’re not called ‘WARDROBE ESSENTIALS’ for nothing. When you know what you need in your wardrobe, shopping becomes less stressful so as your WARDROBE PLANNER I create a shopping list bespoke for YOU and your fashion style. Every client has their own style idiosyncrasy’s hence why they call it PERSONAL STYLING. I offer you ideas on how to dress and YOU choose what you like best, we workshop it together. As your stylist, the most important thing I can do is to listen to your feedback which is key to us finding your style. However there will always be certain features that everyone can benefit from and this is why a quick video to share my style tips is a couple of minutes well spent. 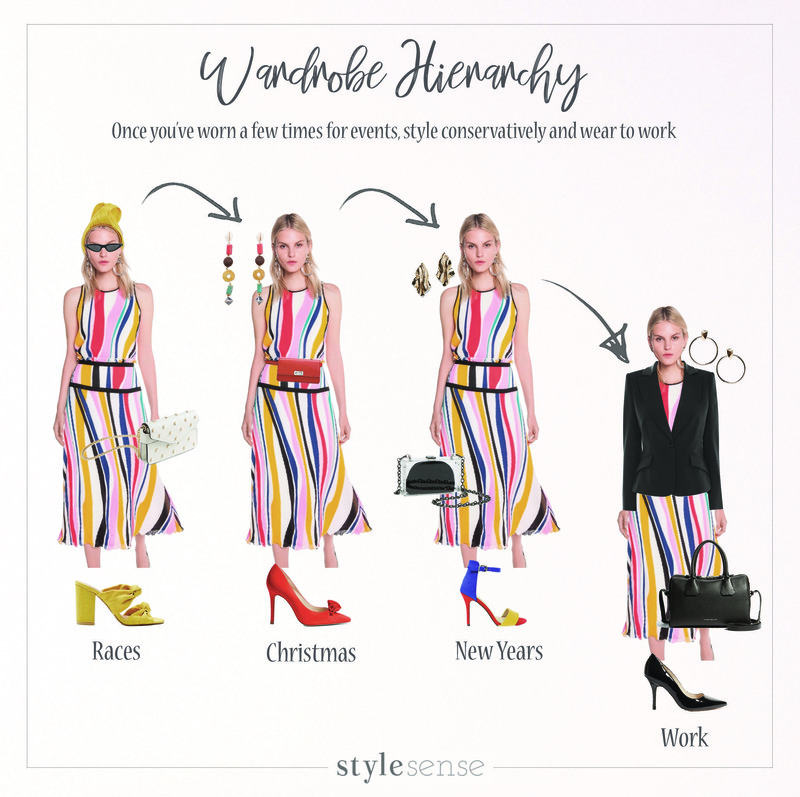 So, working as a COLOUR CONSULTANT in Sydney has taught me a huge amount and interestingly it’s where the ‘science’ part comes in to my personal styling service. A few decades ago, the 4 seasons color system was introduced which is the basis for my personal colour analysis but I modernise it by dividing it in to a 12 colour system which better represents today’s diverse skin tones. This means I create totally bespoke colour palettes for each of my clients. I wrote a little article for Mama Tribe you might be interested in…. Have you heard of them? Mama Tribe are a brilliant organisation with a simple goal – ‘no mum left behind’. It’s an inclusive place to connect with like-minded mums to share their up’s & down’s of motherhood so no mother ever has to feel isolated. Ever. Mums, and particularly new mum’s, are exactly the demographic who would benefit from understanding what their most flattering colors are but ironically they’re the group of people that have the least amount of time to undergo a personal colour analysis! Hence why I offered my fashion advice to show them within a couple of minutes THE most flattering 4 colours they could wear, regardless of where they sit on the colour wheel, to make them feel like they’d had a good nights sleep, despite probably being up all night. 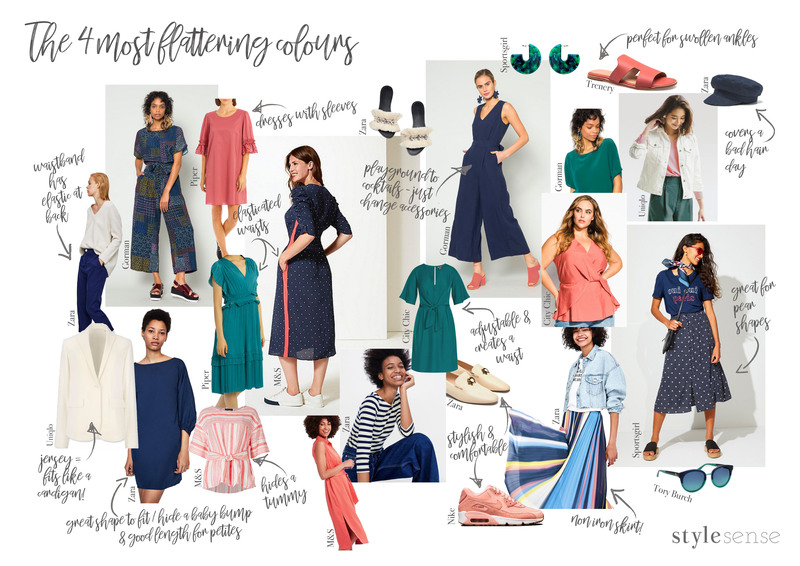 In addition to sharing my colour consultant secrets, I have also put together the above high street edit of these 4 most flattering hues so you can shop with speed whilst achieving a fantastic capsule closet. Purchasing a few pieces from here will give you a mini WARDROBE MAKEOVER ! For me, a statement blazer is still a ‘must have’ this season, it’s a good value, versatile, stylish item. There’s hundreds of ways (well, maybe not that many) of how to dress it ‘up’ & ‘down’ and wearing a jacket always makes you look like your making an effort but depending on the styling not too much effort, because none of us want to look like we’ve tried too hard, do we? But do you know what to look for when purchasing a blazer? This blazer I’ve bought is more of a fashion trend that instantly updates my more basic items and depending on your individual clothes style & lifestyle, there’s a version for everyone. You might prefer a plainer fabric as this one is quite bold, yet this statement stripe is surprisingly versatile, check out my INSTAGRAM for the different ways i’ve styled it. As an image consultant I want statement pieces that are fun and easy to wear which is exactly what this stripe blazer delivers, plus because of the high stretch content, it fits more like a comfy cardigan!! You seek help from a hair stylist for your hair, so why not a clothes stylist for your wardrobe? Some of you plan your meals to make the week run smoother and avoid wasting money, so why not plan your outfits for the same reasons? I can honestly admit that seeking the help of a professional nutritionist has positively changed my world forever!! Her name is Natasha Fayle, she’s the founder of Nutrition For Two and is fantastic. Embarrassingly, I lacked the skills needed in the kitchen to create healthy meals for my family (as my husband can testify). I had cupboards full of food but I didn’t know how to put them together and frankly even when I did attempt to cook, the result erred somewhere between cat food or total frickin’ disaster. It overwhelmed me, created self doubt and made me feel pretty crappy if i’m honest. So I sought professional help to fill in the gaps in my skill set. Now when I look at all the food in my cupboards, I don’t get overwhelmed as I can see the finished product – the meal – and with a few cooking tips I can safely say i’m getting better every month. And as an image consultant, this is exactly what I do for you, but for your wardrobe! I can give your closet a WARDROBE MAKEOVER where I edit, re-organise and re-outfit all your belongings to create a functional wardrobe that brings you joy!! I listen and work with you, imparting my expert advice whilst showing you practical style tips relevant to the real world, how much you choose to take on is up to you. I can help identify your clothes style, teach you how to dress for your lifestyle and personal taste, but how we get there is by workshopping with you. I wouldn’t have had success with my nutritionist if she hadn’t got to know me and the particular way I live my life hence why getting to know you is KEY to our success. It’s called PERSONAL styling for a reason. Posted August 1st, 2018 & under Accessories, Fashion Tips, Personal Style, Personal Stylist Sydney. 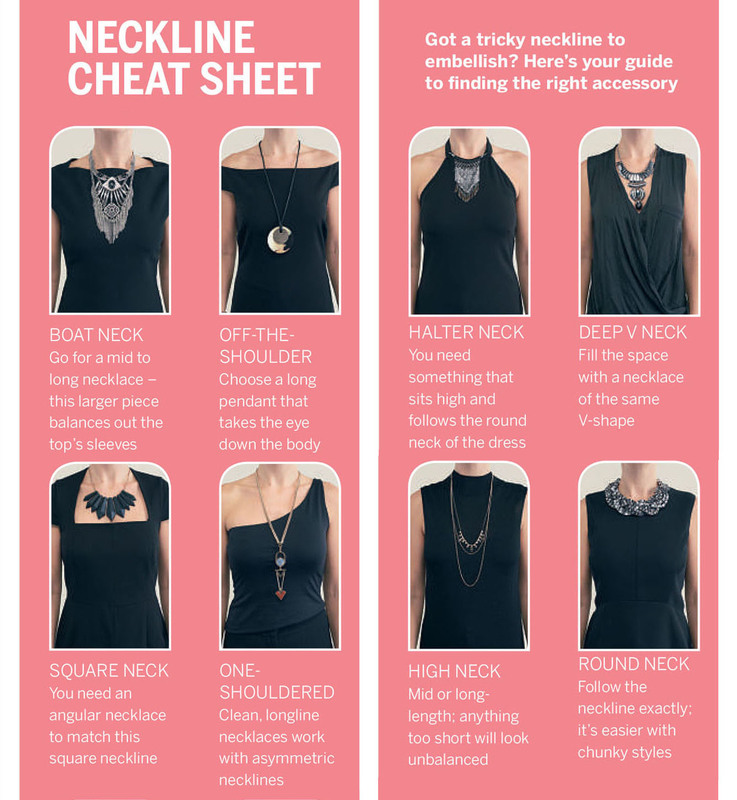 Ever wondered what necklace to wear with what neckline? Particularly the more tricky off-the-shoulder or asymmetric styles? 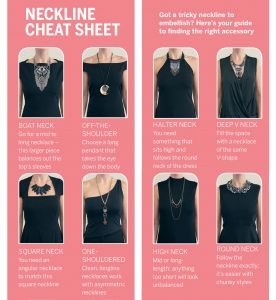 Then check out my cheat sheet I put together for a popular magazine to navigate you through even the most difficult of necklines. – can be incredibly impactful! I’m showing necklaces for a black top but could just as easily be accessories for a black dress, it’s the style tips and theory that matters. Adding jewellery should compliment your outfit, not spoil it. As an image consultant I get asked all the time how to accessorise as it’s something clients can easily get wrong. Jewellery is the perfect way to have fun with fashion so take a risk! Posted June 27th, 2018 & under Accessories, AW18 Trends, Clothes reflecting our personalities, Fashion Tips. Bags – the one item I tend to splurge on is a bag. It used to be shoes but I trashed them too quickly and they would never look as good as when you first wear them…but a bag ohhhHH a good bag looks better with age. A designer bag can elevate even the most basic of outfits, it makes me feel, well ‘dressed’, a bit like the icing on a cake. There’s so many handbag styles to choose from and this is one time I don’t mind carrying around a logo so if you have your eye on a branded style, consider your alignment to that designer and whether it fits your fashion style. My skills as a wardrobe planner mean I spend a lot of time researching the bag, visiting it in store, trying it on making sure it’s practical etc. it also needs to be a bag suitable to wear everyday so my cost-per-wear is relatively low. Then the personal shopper in me kicks-in and I save-up or stalk it online and buy it when it’s on sale! As a fashion stylist I might buy a more trend-led bag but my style advice to clients would be that a smart bag purchase shouldn’t date easily but be more of a classic investment that flatters your clothes style for years to come. Now, because i’ve spent all this time and money on it, I want it to work extra hard for me so I give it a StyleSense makeover! Why not try it and give yourself the gift of a new bag, for free and without any sewing!?! What If I don’t Have a Bag Strap to Swap? 1. buy them from the high street – see my facebook page later this month for details. 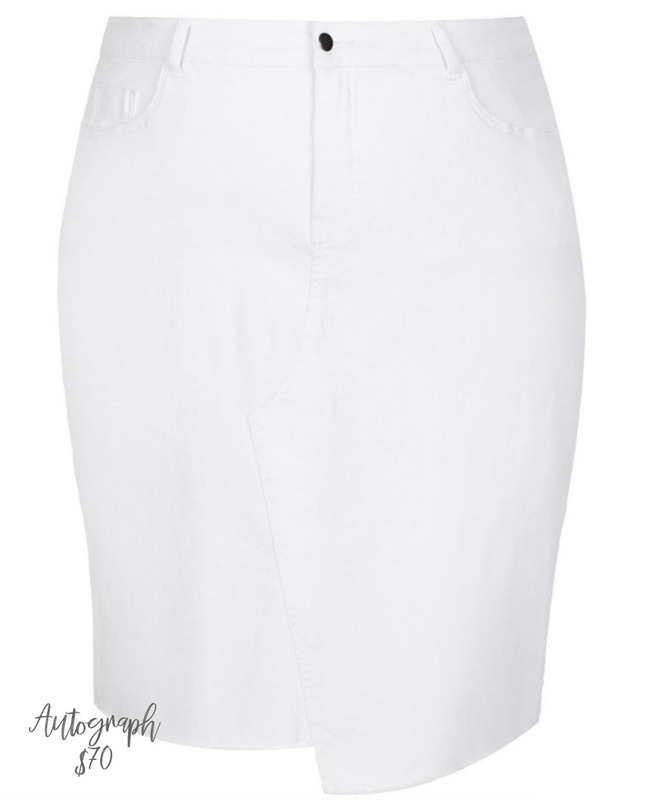 2. you could try this second style makeover which uses a skinny scarf or a soft belt as a bag strap. 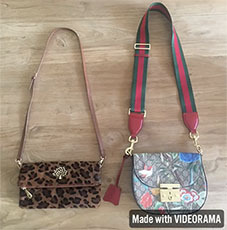 Un-clip your current strap to transform your bag by tying on a long piece of fabric, stitching once of necessary. Perfect for the small bags that are a huge fashion trend for Autumn/Winter 2018. Show off your personal style by being playful and give these easy fashion tips a try! Posted May 22nd, 2018 & under AW18 Trends, Fashion Trends, Personal Style. 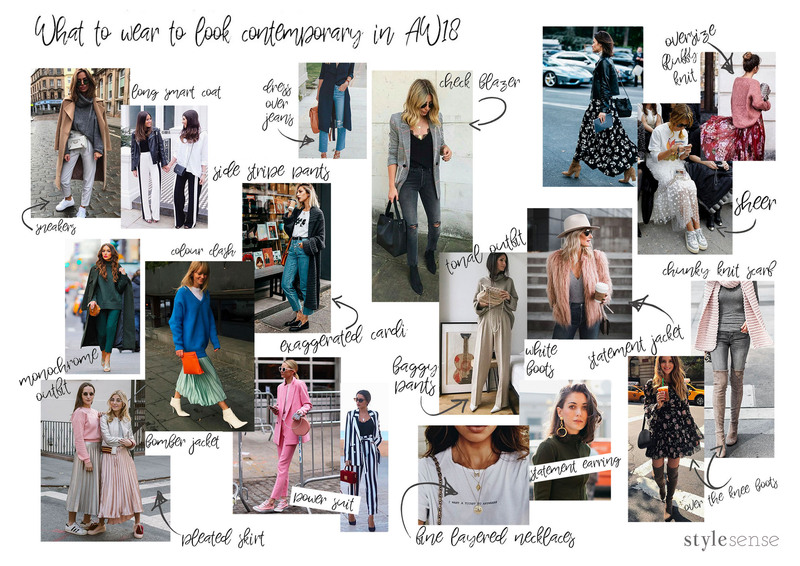 As a fashion stylist, I feel I have to offer my round-up of the AW18 fashion trends, but to be honest, most of my clients don’t care too much about looking so directional or ‘on-trend’. Therefore as a personal stylist, I thought it was actually more important to create a mood board showing a more realistic approach to looking stylish & contemporary. 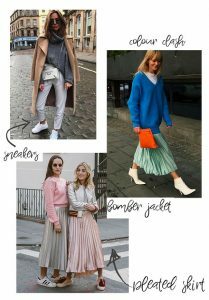 Basically, if you want to look modern then purchase a few autumn winter 2018 pieces similar to the above and you’ve got it! Pick and choose depending on your personal taste, comfort level and budget, then mix with your current wardrobe to update it. If you want to look more fashionable, then wear the items within the same outfit. If your aim is to appear more directional, then look up my AW18 trends here. A lot of the clothes seen above represent slower moving trends = contemporary classics which have become the versatile backbone of many modern wardrobes. 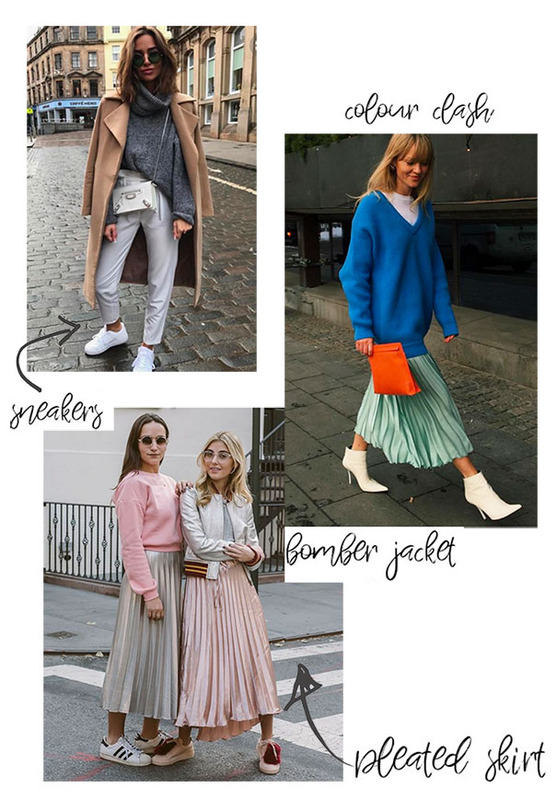 For example, take the pleated midi skirt which was introduced several seasons ago, it still looks great and it’s even showing as a major trend on the autumn winter 2018 catwalks! Same for the leather biker, bomber jackets, statement earrings and my favorite fashion trend that doubles as THE most practical item I own – the sneaker. None of these pieces are particularly ‘new’ but they’re still showing on international runways. Now, I know the most directional version of the sneaker is the chunky 90’s style, but even if you wear a slicker more feminine sneaker you’ll still look modern and let’s face it, those chunky trainers should stay in 1990 if you ask me. Not all trends are nice looking. Some just make us look like a fashion victim. The catwalks no longer dictate fashion trends like they used to and certainly not at the speed they used to, hence the repetition of certain styles season-after-season noted above, which cement them as a contemporary classics. Trends have slowed down which is great for mass consumerism. 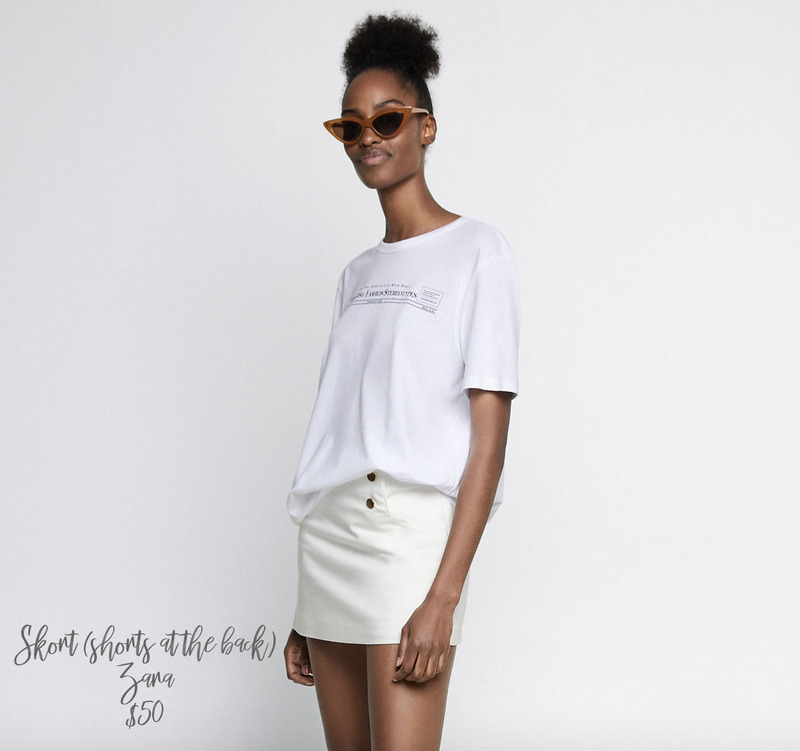 With the rise of social media, it’s consumers that largely dictate when fashion styles becomes outdated working from the street-up rather than the catwalk-down. 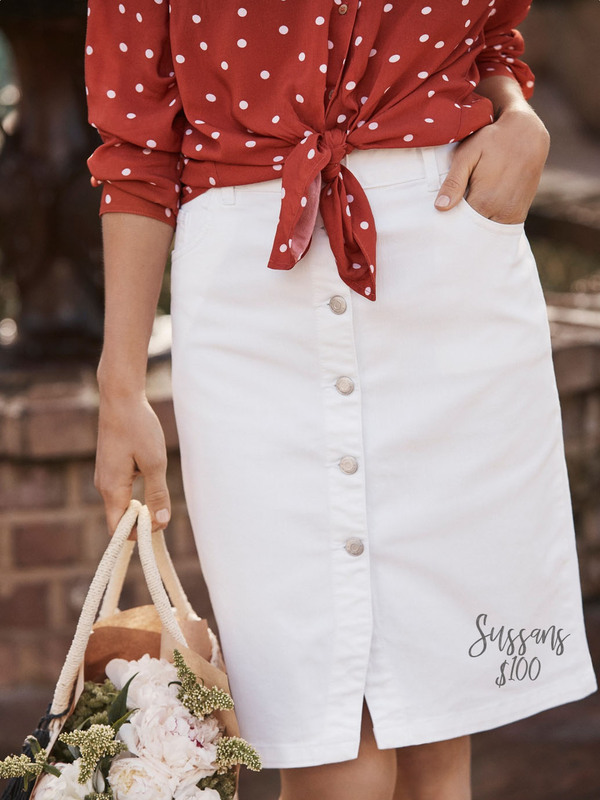 If a fashion trend is versatile, affordable and practical then chances are it will hang around longer and not become obsolete after one season. But my answer is simple. By dressing yourself every day you automatically take part in fashion, I just want to help you understand what clothes styles will make you look dated, versus modern, versus directional. The choice is yours. To read more about other ways my styling service is different, click here.